When planning a training schedule, it’s generally important to focus on one specific race rather than try to peak for every single race you factor in. Races either side of your focal points can be used to either measure your fitness against your goals, or to add some focus to your recovery. Generally, a runner’s fitness will go through peaks and troughs – although those peaks will hopefully get higher, and the troughs will be less deep as time goes on. If you’ve ever wondered how the racing season in the UK breaks down, the chart below is compiled from data from the Runner’s World event listings. It’s not a comprehensive listing system, and there are some limitations to the data, but it gives a good indication of when the profile of the British racing season. 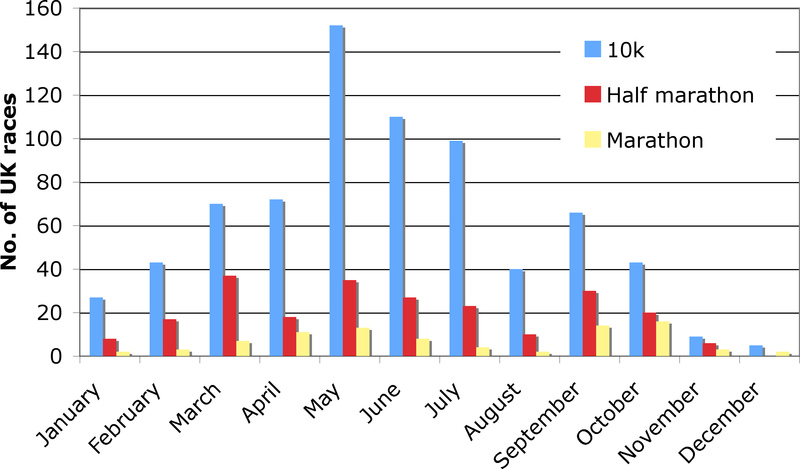 Seasonal fluctuations in the number of races in the UK over a year. What is perhaps surprising about this chart is that October is technically marathon month, with more 26.2-mile races than any other month. However, the average field of a marathon is remarkably small, with a substantial number registering fewer than 500 runners. Contrast that with the 37,000 or so running the Virgin London Marathon in March. We’re in the midst of the spring marathon season now. The big city races are joined in the racing calendar by a number of smaller 26.2-mile events. Hence many runners spend the winter months building their ‘base’ (the mileage they cover in a week) in preparation for long, sustained efforts during the early months of the year. The summer brings with it a horde of shorter races, and the need for speed. Running long is great for endurance, but generally bad for speed. With the marathon out the way, training schedules focus on a variety of techniques for improving leg turnover, speed and anaerobic limit. While speed is built over the summer months, endurance generally trails off. After all, most long runs are scheduled for Sundays, and most races are held on Sundays, so it’s only natural the the racing season should affect a runner’s fitness levels. This is something I’m experiencing first-hand at the moment, having had a peak of endurance for the Paris Marathon and now trying to find speed for the summer 10k season. Suddenly maintaining a pace under 4-minute kilometres seems a whole lot more challenging than it had seemed at the end of last year.